In the late 90s, I worked at the famous (infamous) "virtual/paperless" office experiment that was Chiat/Day New York. Designed by Gaetano Pesce and Olafur Thordarson, it felt like a colorful, chaotic fantasy movie set that didn't quite mesh with the hard edges of computers and ceiling tiles. Fun? Absolutely. Did it inspire our work? Not really. Many years ago, I worked at the famous (infamous) "virtual/paperless" office experiment that was Chiat/Day New York. Designed by Gaetano Pesce and Olafur Thordarson, it felt like a colorful, chaotic shrooms induced dream that clashed with the hard edges of computers and ceiling tiles. Fun? I guess. Did it inspire good work? Not really. The irregular shaped rooms and pockets of spaces no one could use made it hard to feel comfortable. Having said that, you couldn't say it was boring. When we moved into a much more conventional midtown office, it was jarring how bland and grey it was. 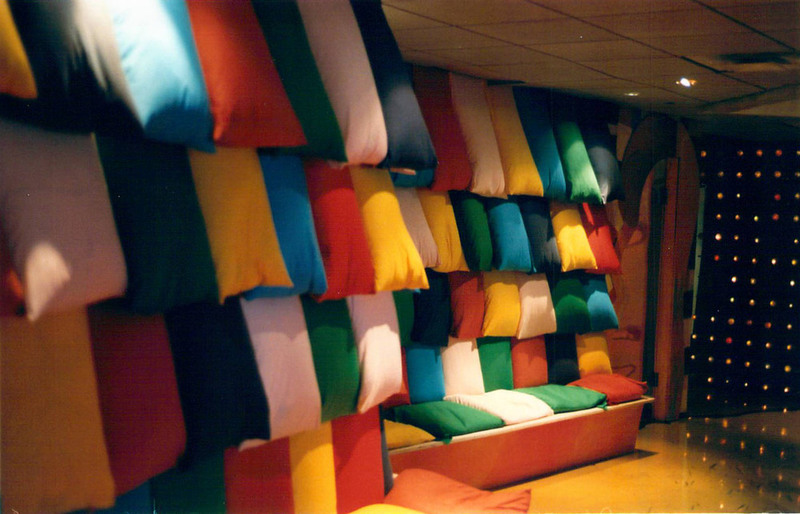 Nowadays, playful office designs are the norm at every ad agency but this Chiat office in the 90s was probably the precursor that helped other office designs be more successful. The window that peered into the IT department looked like this. As an important hub of the "paperless office" experiment, this was supposed to be a place where people checked out their laptops and cordless phones in the morning... then park themselves at random areas of the office (or work from home "virtually"). In reality, people found that they still had too many paper documents and territorial desires that prevented them from not having their own cubicle or office. By the time I started (which was already a few years into the experiment), we all had assigned cubicles and offices with stationary computers and phones. Some open areas were actually pretty comfy. And being on the 37th floor, the views of Brooklyn Bridge and Word Trader Center were spectacular. But windowless hallways like these made me think I was in a "Pee Wee's Playhouse" themed insane asylum. A coworker once described: "it's like being inside of a small child's stomach just after they had eaten an entire bottle of Flintstone vitamins." But in a lot of ways, it was just like any other office. You ate your lunch in the common area and picked up your print outs in another. Ultimately, the weirdness of the office design became routine and we just went about our day without really paying attention to it. The super talented people I worked with were ultimately the inspiration for my creativity anyway. And there were no shortage of that. Here's the office I shared with Richard Overall. Didn't everyone have a cactus with fuzzy dice back then? When we moved to midtown, I assumed everything went to the dumpster. But apparently, a door goes for $16,000 these days. Who knew?